I got with my neighbor and got everything chucked up and started turning. The first thing I learned I will not use bubinga on the second globe There is just to much difference in hardness. Made for difficult turning and ridges and low spots. When I drilled and epoxied in the washers I used a spur point bit that had a bout an 1/8” spur below the bottom of the hole. I was able to us that hole to tell when I was getting close to the depth I needed for the washers. Unfortunately I didn’t get depth tolerances close enough between layers. I actually had some washers fully exposed in their squares. You can see some of the spur holes here as you get closer to the top you can actually see the washers. I didn’t get a picture of that. 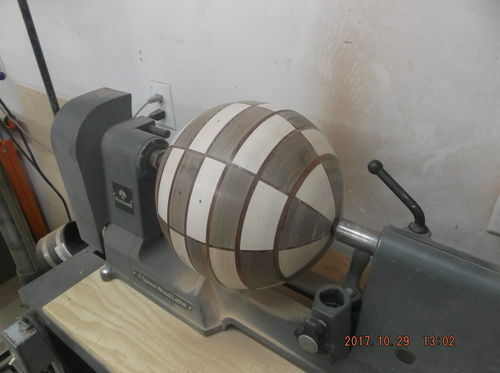 Time to glue up the next globe. I made adjustments in the angle and depth of the washers glued everything up and a 2 weeks later went back to the lathe. On this one I used eastern red cedar as the divider wood and that made the turning much easier. I used a forstner bit to drill with this time so did not have as deep a point to turn to so useed one of my magnets to check for depth and holding power. I ended up with a useable globe. I was a little concerned about the weight and how my stand was going to hold it. We’ll worry about that later. Back to the bench and glue up globe #4.I was thinking about weight while I was drilling and epoxying in the washer. It hit me that I could make the sector thinner and still have plenty of gluing surface so more measuring on the old one cut in half and I narrowed everything down and cut a third or more off the weight. Bak to the lathe and turn this one out. I am getting much better and faster. 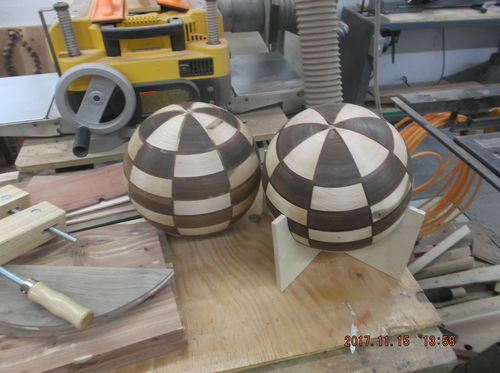 I now have 2 useable globes and need to figure out the base. Wow Bruce you sure have undertaken some ambitious projects of late. The globes are awesome looking.